This treatment is a powerful combination of Massage Techniques and Reiki Energy. I like to work intuitively with each client, and this includes working with their physical energy during massage. However I often feel drawn to provide Reiki Healing during the session where appropriate, as the human energy system heals best when the emotional/ physical and spiritual aspects are worked on in conjunction. You will still experience a deeply relaxing massage, but also healing on a deeper level as the Reiki Energy is activated through my hands. This type of treatment works in perfect harmony with your energy system, revitalising, relaxing, calming and energising where required. Chakra Balancing can be done using a combination of techniques, sometimes utilising Crystal Energy, Reiki, Visualisation, Colour Therapy and Affirmations. Each chakra in the body is like a power station, bringing our body to life and keeping it healthy. The Chakras are centres of activity that receive, assimilate and express life force energy. They are responsible for our physical, mental, and spiritual functions. By receiving a Chakra Balancing Treatment clients should experience feeling more grounded, more centred, more connected to self, they may experience more focus and better health in general as the energy system works as one invisible whole. Crystals bring colour and light into the aura and into the physical body via the chakra system and the subtle layers of the body through the principle of vibration and resonance. Massage therapy works to improve circulation, relieve muscle tension, and aid general feelings of relaxation and well being. 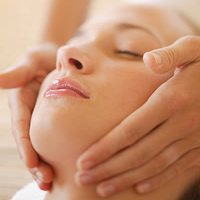 Swedish massage includes long, relaxing strokes, kneading, friction, tapping, and shaking motions. It is effective for most ailments, because massaging the skin, the body's largest organ, sets up a chain reaction that produces a positive effect on all layers and systems of the body. It affects the nerves, muscles, glands, and circulation, while promoting health and well-being. Swedish massage helps release the body of unwanted strain and stress. Your body will feel rested and your mind at ease for a total pampering experience. Indian Head Massage is used by practitioners to help reduce stress and fatigue, increase mental clarity, and relax and rejuvenate the receiver. It is a powerful detoxing and relaxation therapy. Quite different from conventional wax candles, a Hopi ear candle is actually a cotton tube, impregnated with beeswax, honey and therapeutic oils, that is painlessly inserted into the ear to draw out impurities, relieve pressure in the head and sinuses, and aid hearing problems. The treatment is also combined with a soothing acupressure facial massage to encourage relaxation and effective drainage of the sinus area. Users of Hopi ear candles have reported success in treating balance and inner ear problems, build up of wax, ringing in the ears, tinnitus, hearing difficulties and sinus problems as well as helping to heal persistent colds, ‘flu, sore throats, stress, headaches and migraines. The treatment is suitable for children and is a good alternative for people who have found syringing uncomfortable. A soothing and relaxing and rejuventating holistic facial massage, which utilises ancient acupressure points to relax and tone the facial muscles. The treatment is complemented with a head, shoulder and neck massage using some further acupressure points and stimulation of the meridian lines.. During the treatment, the gentle massage relaxes and releases the taut muscles of facial expression. Nerve endings are soothed. The complexion will look smoother, brighter and more relaxed. Emotionally, layers of tension are lifted away, leaving you truly relaxed and floating on air. This facial treatment uses technique rather than expensive products to achieve fantastic results. Your feet support your entire body weight throughout the day. Think of the relief you can experience from an entire 50 minutes of massage done on your knees, lower legs, and feet. Receiving work on the feet often helps induce a deeper state of relaxation than when receiving ordinary bodywork, allowing those hard-working adrenals to take a rest. Thai Foot Massage can help increase circulation and flexibility in the foot and ankle joints. It's perfect for dancers, hikers, athletes, people with poor circulation, and those who love to have their feet rubbed! Thai Foot Massage is performed on a massage table, clothed. Please bring comfortable pants that can be rolled up to just above your knee, or shorts to your session. The treatment is similar in many ways to a normal body massage but uses the heat of the stones to penetrate deeper into the tissue and muscles. The treatment includes standard manual massage techniques and the placement of specific stones along the energy centres and points of the body. Thermal Stone Massage is suitable for Muscle relaxation, easing stress and recharging your energy levels and releasing toxins. It also improves blood circulation, muscle and back pain, arthritis, stress, anxiety circulatory problems, insomnia, depression and Multiple Sclerosis (MS). If you have any queries or questions please feel free to email or telephone in confidence.